Latest post Fri, Sep 14 2018 4:19 PM by Fish. 4 replies. I have vertical video (NOT cropped 16x9 footage). Need to edit it vertically, and export it vertically. Should be simple given I can plug in whatever numbers I want into the Source settings. But every attempt to apply a transformation in the source setting results in a cropped output. 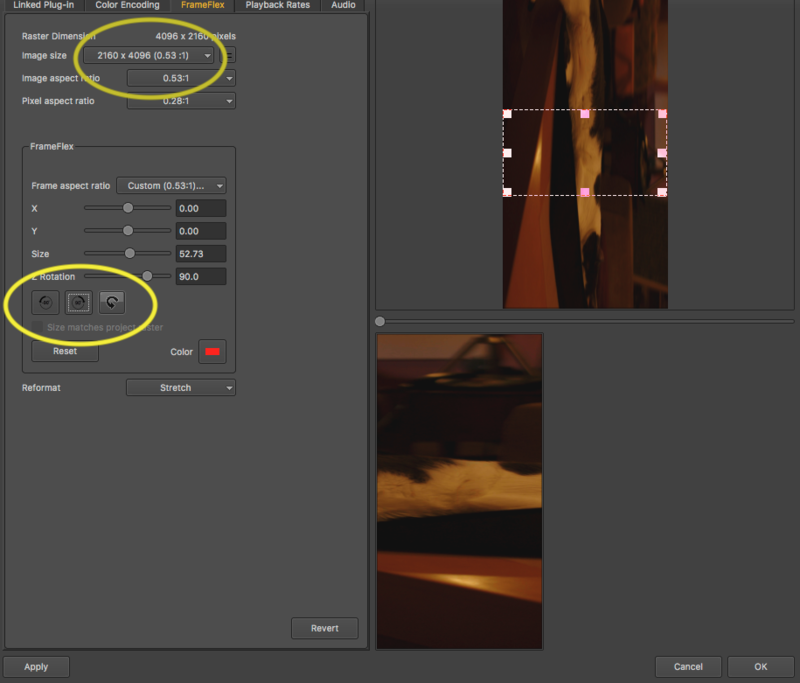 The source settings window is assuming my footage isn’t what my footage is. My source setting window doesn’t believe me. Crazy that the rotate function insists on cropping it and doesn’t simply rotate the whole frame in the composer window. I’ve scoured the tutorials available and nothing is a good fit. It seem impossible that I can’t find a solution to this. Even Kevin’s tutorial assumes you’d be shooting 16x9 and cropping. NO! Don’t want to do that. Footage is 9x16. Is this possible to simply apply a source setting? Sad if it isn’t. AVID man, AVID fan (since 1993 with version 4.5 - before multiple tracks! )...like to solve my own problems and I try not to bother anyone unless I'm really stumped. Did you happen to try to create a custom project with the size needed to see if that makes a difference? Sorry...should ahave mentioned, it IS a custome project size. The only road block is interpreting the footage. AMA link a 1920X1080 video. The trick was changing the Frame aspect ration in the lower frameflex box to 9:16 then stretching out the frameflex frame in the RH preview. Worked fine. RH preview? I've changed the ratio. But the stretching part does not work it won't let me change the ratio of the box it applies. only smaller or larger. It really should be simpler than this.